I know it is my son who is getting married tomorrow and not me, but I still have a major case of the jitters! lol I can't stitch, can't even concentrate to read, so I thought I would share a few pictures and babble away. First off I'm sharing photos of what I want for my birthday. Got DH out to the campsite last night so he could see it. Here is DH right after I popped this bundle of joy into his arms at the campsite of the breeder. Notice the puzzled look on his face: "You want this for your birthday? Within thirty seconds he has reached the second state of holding a puppy: "She sure is cute!" And, as simple as that, she has wrapped her little curly tail around his heart and she is mine! She is an eight week old Pomeranian puppy - just as sweet and darling as can be. Enough of puppies for now. Here is the swallow nest that is rebuilt every year in one of the outhouses in the park. It is a concrete building and the door has about a two inch space at the top which is how they access it. This outhouse is at the back of the playground and sees very little traffic so it is a nice quiet place for them to call home. And in this closeup of the nest - have you ever managed to paint anything as lovely as that egg? I love all the feather work too! I promised myself I would stop obsessing over the beavers and their handiwork but I lied. Here is a closeup of their latest project. See all the wood chips they leave at the base of the tree? Did you know that a beaver's teeth grow continually throughout their lifetime? They need to, don't they? They chewed their way about three quarters of the way through this tree and left it for a couple weeks. Last week we had a bit of a windstorm and down it came. I know all creatures are entitled to eat and build a home but I can't help seeing the loss of this tree as tragic. What are beavers doing on the prairie anyway eating the few trees we have? They should pack up and move to a forest! Next subject! Are you starting to wonder yet if I have ADD? Well, you won`t be the first. This is just a little wild rose I took a picture of yesterday. The wild rose is the provincial flower for my province of Alberta. I didn`t capture the colour properly - they are such a delicious shade of pink and smell divine! How can you look at this and not be thinking of stumpwork? Okay, that is all I have to say today - see you all in a couple days after the wedding! Just a quick note to let you know I have added another way you can get entries. Check out my initial post (go back two) and you will see you can now get three extra entries if you blog about my giveaway and let me know with a comment on my initial post. 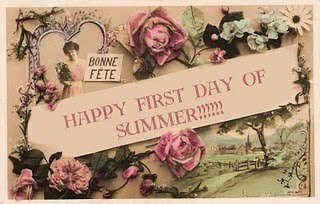 Pat Winter is celebrating the first day of summer by having a fabulous giveaway of summer crazy quilting supplies on her blog. Check out her giveaway and see all the wonderful items she is sharing with her readers. You will enjoy her blog too if it is new to you - you don't know what you have been missing! I have been thinking about having some giveaways - I feel like I have so much to celebrate lately. My son is getting married Saturday and that is a good reason! I have decided that I will have a giveaway every Friday for the foreseeable future - like til I run out of stash which will be no time soon. Since I love most crafts there is no telling what each Friday will bring. I will post about a giveaway each week, together with my reason to celebrate, and the following Friday I will announce the winner and what the giveaway for the following week will be. So, this first week you can enter to win this postcard. 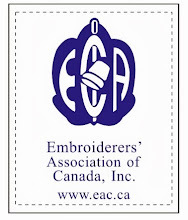 If you have been following, you might recognize this as my entry into the Embroiders' Association of Canada's Design a Notecard contest. I didn't win but you can! I will stitch this backing onto it and it will become a postcard. I'll either send it in an envelope so that you can use it as a postcard to send to someone special or, if you prefer, I'll put a stamp on it, get it postmarked and then send it off in the mail to you enclosed in a plastic envelope. I think it needs to go protected like that because of the beads - no telling what havoc they would wreck on the postal machines. So, either way, you get a fabric postcard made by me with love. For one entry leave a comment on this post and make sure you leave me some way to contact you. For a second entry, follow my blog and let me know in a separate comment. For three extra entries, blog about my giveaway and comment again to let me know! Leave me a link to your blog so I can check it out - thanks! On Friday, July 2nd, I will draw a name and let you know who wins the postcard. It is almost halfway through 2010 so I decided to look back on my New Years Resolutions and see how I am doing. So far, so good. I received the contract in the mail to sign just this week - I will be teaching a class on Beginner Crazy Quilting one evening a week from Oct 18 through Nov 1 of this year. Ta-dah! Of course, it could still be cancelled for lack of enrolment but I'll worry about that closer to the time. I might as well cancel this one off the books right now. I have made a couple gifts and have bought some more as I saw the perfect thing for certain people but the most ambitious I am likely to get out here at the lake is knitting dishclothes, scarves or mitts. Haven't started yet but I watched the wonderful DVD by Judith Baker Montano the last couple nights and now it actually seems doable. Wonderful DVD, by the way. I would highly recommend it. Four! Did I say four? Okay, I have entered two things, an ArtBra to The Way to Women's Wellness, hoping it would make it in the calendar, and my EAC Notecard Contest entry. At least I said enter, not win! So this is still doable and since the year is only half over I am halfway there. Okay, I still want to do this and no, I haven't got beyond research on one article. So, I guess I better get moving on this one. 6. I will create and give at least one item a month to charity - this will be my service project for the year. I will post pictures to keep myself honest. lol Some of the groups I would like to do some work for are Grandmothers for Grandmothers (the purse auction), Aids Angels, The Toy Society, Alzheimer's Art Quilt Initiative, and of course I'll take part in CQI's Making Memories project again this year for Breast Cancer. In addition I'll be doing small things on a local basis like baby quilts and baby sets for the hospital gift shop (profits go to the Ladies Hospital Auxiliary) and knit caps for the newborns at the same hospital as well as place mats for Meals on Wheels. There are actually a lot of things you can do locally if you look around. Even the local library is in need of book bags for the local literacy program. Not doing too badly on this one. My first AAQI quilt is finished and sent away, the ArtBra is done and sent away and I have taken one baby set to the hospital. So, I need to pick up the pace a bit but it is still doable. This one has been great and a bit of a break through for me. No matter how I am feeling I am usually disciplined enough to do this now every day. And, as planned, 15 minutes usually turn into a couple hours so that is all good. I got a good start on this one before coming out to the lake but unfortunately I am no longer living in the same house as my sewing room so I can't do anything more on this until I go home in the fall. I had posted awhile back about the piece I made and entered in the Notecard Contest of Embroidery Association of Canada. 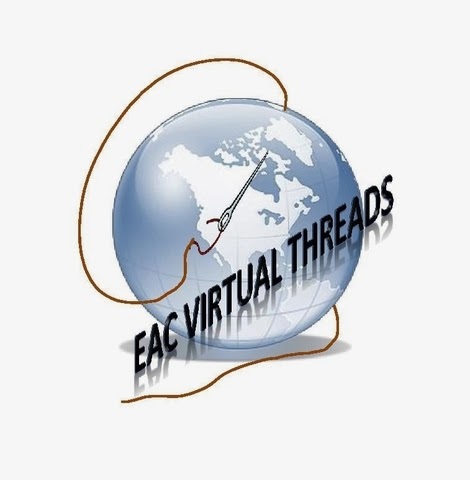 I just wanted to give you a heads up that all the entries are now online at the EAC site to be viewed. There was some lovely embroidery entered in the contest - after looking at it it would be hard to feel bad that my little card wasn't chosen. Instead, I feel honoured to have been in such company. Have a look and enjoy! I have been experimenting the last couple nights with Pekinese Stitch (aka Chinese Stitch) because it is a required stitch in the EAC course I am taking. You start with a row of backstitch and then wrap the backstitches as I have done below. Make your backstitches a little looser than you usually would to allow room for the wrapping. Use a crewel or blunt needle for the wrapping so that you don't split any threads. I have started over and will share that one when I have it done. I am much happier with how the second one is going together. In the meantime though, Sharon B has an excellent page on Pekinese Stitch in her Dictionary of Stitches. Where would we be without Sharon B!? She tells a bit about the history of the stitch as well as very clear how-to and a lovely variation. EHow also has an explanation of the stitch although no visuals. Maureen of CrazyQstitcher has a landscape she has done with this stitch if you would like to look at the photo of that - it illustrates a more traditional use of the stitch. By far the clearest illustration I found of the stitch can be found here. This is a very interesting stitch from a historical standpoint and there is a fair bit of imformation out there if you google it. In any case, have fun and I hope you enjoy this week's challenge! I have a tip to share with all you other stitchers. I discovered this quite by accident and was a little excited about it! lol I bought a set of the Glade Scented Oil Candles in the photo above. 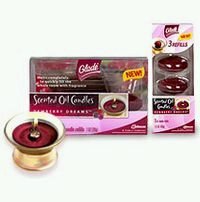 They have a glass holder and the candles sit in it and burn away while scenting the room with yummy fragrance. After the candles were used, I held onto the holder thinking I might use it for the base of a pincushion. Instead, I discovered that it is very handy for putting a few beads in while you are working with them. And, an added bonus, since the candles are held in place by a magnet on the center metal portion of the bowl of the holder - it is perfect for your needles and pins while you are working on something. I was busy bagging up some packages of smelts which the fishermen like to use for bait - the pike really seem to like them. While I was bagging them, DH was watching me and commented that it was a shame that they weren't the larger smelts. I innocently commented back, agreeing with him and adding that the larger smelts were nice eating. Well, you should have seen his jar drop! What??? Yes, I said, we used to have smelts for supper when I was a kid and I really enjoyed them. Well, you would have thought I had suggested eating slugs! Now, while DH was giggling hysterically and running for the phone so he could tell all and sundry that his wife eats "chub", whatever that is, I was remembering this was one of my favourite meals! And my absolute favourite dessert was hot cooked macaroni with canned milk and brown sugar on it. And we ate organ meats long before we knew they were good for you - we ate them because they gave "the guts" away to anyone who wanted them. So, my question is what weird and wonderful foods do you remember from the good old (broke) days? And second question, how can I get even with the giggler? This is Carolyn's extra block in the Pansy round robin I am in at CQI. I got to pick which block would be the shared one so I chose this beautiful pink one. Since there will be five of us stitching on this little six inch block, each of us will only get to do a little. I did the feather stitch seam. The detached chain stitches are done in a tatting thread. I couldn't resist using it since it was a pink to green variegation. It was actually quite nice to embroider with. I also did the button trail. First of all, I decoupaged the pansy picture onto a mother of pearl button. At the top is a silk ball button and I used Adirondack dye (Willow) to dye it to work with the greens in the block. The little shell button next to it was also dyed with a rose colour of Adirondack. Other than that, just the usual assortment of buttons, beads and charms. I'll be sending Carolyn 's blocks off in the mail in a day or so. This is the entire shared block with lots of room left for everyone else to play. Notes from the Lake - I'm bushed! Too tired to even add a photo to this post! What a day! I woke up and cleaned all the outhouses at the campground. Then, since my mower is broken, the boss turned up with THE BIG ONE! He promptly mowed the entire place in half a day - what would have taken me a week on my piddly little riding mower. Course, with the boss around, a person has to keep looking busy so I basically followed around picking up all the litter that had been hiding in the long grass. Since the mower can't reach under the concrete picnic tables I got out the whipper snipper and managed to get all that done. Ended up with a back spasm for my trouble and hobbled around collecting from all the weekend campers that came out today. After that, it was dark! I am too old for 12 hour work days that actually include physical work... I am actually too tired to stitch so I am breaking one of my resolutions and not even doing my mandatory 15 minutes of stitching today. If you would like, you can send me some cheese to go with this whine! As for myself, I'm taking an extra pill for the arthritis and an Advil and hitting the sack. No stitching day - bummer! Carolyn's Pansy block is done! Sometimes I think I just don't know when to quit and this is an example of one of these times. I just loved this block so much I had to keep adding one more thing... and one more thing.... and one more thing! I hope Carolyn likes it and doesn't think I went too far over the top. Without further ado, here is the finished block! I had so much fun with this block and tried several new, or nearly new things. I had a great time with all the seams - I seem to be developing a "thing" for detached chain stitch. They turned up all over the place! lol I think my favourite seam is the one that runs up the left hand side - it is a feather stitch done in green perle cotton with flower buds made of three side-by-side bullion knots in a pink varigated perle cotton. Each flower bud has a clear glass bead at its base. Then again, the seam across the top was good fun too! That one is a crossed herringbone (is that an actual stitch or did I make up that name? lol) and a chevron stitch, one on top of the other. There are trios of detached chain stitch on the tops and bottoms of the chevron stitch and trios of little beads at the tops only of the herringbone. All of it was done in perle cotton. All in all, I think I went a little colour crazy on this lovely monochromatic block that Carolyn was silly enough to trust me with! This is my second attempt at a velvet pansy. I learned how to make these at last year's CQI Retreat and then never quite got around to making another until now. It was fun - I need to collect more velvets so I can play more with this technique. Here is how the button cluster ended up. I posted about the decoupaged pansy button in an earlier post. To it, I added a green silk covered button, a small mother of pearl button, a vintage rhinestone button, two more common buttons - one yellow and one green - and those two I attached using beads on top. These little pansies at the bottom of the block came straight out of A - Z of Embroidered Flowers. They are easy little things: buttonhole rings in two colours, a detached chain stitch across the middle of each, a yellow french knot in the center and a few black highlights. The leaves are simply more detached chain stitches. All done in perle cotton again except the french knots and the black highlights - those are good old DMC cotton floss. Last but not least, this cute little pansy is half of a set of earrings I found at the thrift store. Isn't it sweet? I pried the back off and then glued it to felt. After the glue was dry, I trimmed the felt and then sewed through the felt from the back of the block to secure it. Hopefully it will stay put! Well, that is it for this block. It was so enjoyable to work on with its pansy theme. I am the first one to work on Carolyn's blocks in this round robin so I got to have my pick of all the blocks and also got to choose the shared block. We decided to each stitch 1/6 of the 6th block in this DYB, so when the blocks go home to their owners they will all be done. I'll post a photo of my share on the 6th block later on - it's getting to be bedtime now! I won Nicki Lee's giveaway! A little while ago, I posted about Nicki Lee having a giveaway on her blog. Well, I had not mentioned it before but... I WON! You would not believe how beautiful this little cupboard is in person. The mosaic work is beautiful - each little rose on the china pieces is perfectly trimmed and situated. It has inspired me to try a mosaic project of my own. I will share photos of that when and if I get it done (I have found the perfect piece to try mosaics on though and have it safely stashed in the shed here that is meant to hold my campground supplies - lol). The drawer knobs on this cabinet are beautiful pieces of costume jewelry - just perfect! But, did you wonder what was in those three little drawers? The bottom drawer held a surprise! Three little mother of pearl fish beads and three pieces of Nicki Lee's beautiful hand dyed lace! I can see an Under the Sea themed piece in my future now! One of the other drawers held a treasure trove of more of Nicki Lee's gorgeous laces! I just love the delicate colours she achieves on her lace. My favourite out of this batch is the piece of trim with the mauve tulips - isn't it just almost too gorgeous to use?! Then, as if that wasn't enough, there was one more drawer to explore... more treasures! This time it was an assortment of ric rac, beads, buttons, threads and ribbon. I am so grateful to have these wonderful additions to my stash! Thank you, Nicki Lee! Now, I am happy to have won but I am sad that I sent other people over and they didn't win! So, first of all, I think I should tell you where you can get gorgeous laces like these for yourself. Nicki Lee sells them on her Etsy store, Raviolee Dreams. I still feel guilty so I think I will have to return the favour, balance the karma, etc. by having a giveaway of my own. Stay tuned! Rebecca at A Gathering of Thoughts is having a wonderful Shabby Cottage Chic giveaway. If you love pink and girlie things this one is for you. Check it out! I saw this buttonhole eyelet flower on one of the round robin blocks at CQI and instantly fell in love with it! So, I have chosen it for this week's BAS challenge - I hope you have as much fun with it as I did. These were my first attempt at Buttonhole Eyelet Flower and I did them in #5 Perle Cotton. If you would like to see a much nicer example check out Sharon B's Pintangle blog where she featured this stitch as Week 6 of her 2010 TAST. Her flowers have much nicer petals than on my attempt above. Have fun and please share some photos of what you do! I am currently working on a block for Carolyn in a Pansies, Pansies, Pansies DYB Round Robin at CQI. I chose this gorgeous yellow and green block to work on and although I originally intended to stay pretty monochromatic, that didn't last long! So far I have done the button cluster with the decoupaged pansy button I made and some seam treatments. Hmmmm.... no pansies yet? They will come into play more when I get to the patches. Such a pretty block - I am really enjoying working on it. What is it with abandoned farmhouses and the prairies? I swear I think people just locked the doors (or not) in the Depression and walked away and left them to fall down on their own. With the prevailing winds from the west a lot of them just lean further and further until they fall over. I drive by this one all the time and always think I would like to take a photo of it and finally did. In an earlier post I mentioned that dh had built me a balcony on the second floor of our house so we could enjoy the view of the mountains. Here they are! They show up pretty well when they are snow capped like this. My view isn't actually this good - I admit to using the zoom on the camera! While the rotten weather is keeping the campers away in droves, it is making all the usual residents feel more comfortable to show their faces. This deer has been quite brazen this past week - walking close to my site and peeking over to see what I am up to. She is a very welcome visitor. This really looks like the coolest toy around for sane quilting - accurate cutting without the tedium! To enter to win one, check out Bejeweled Quilts by Barb and put in an entry! Just a note to let you know that the June auction quilts up online now if you would like to have a look or make a bid. There is a lovely mini crazy quilt in the auction this month!